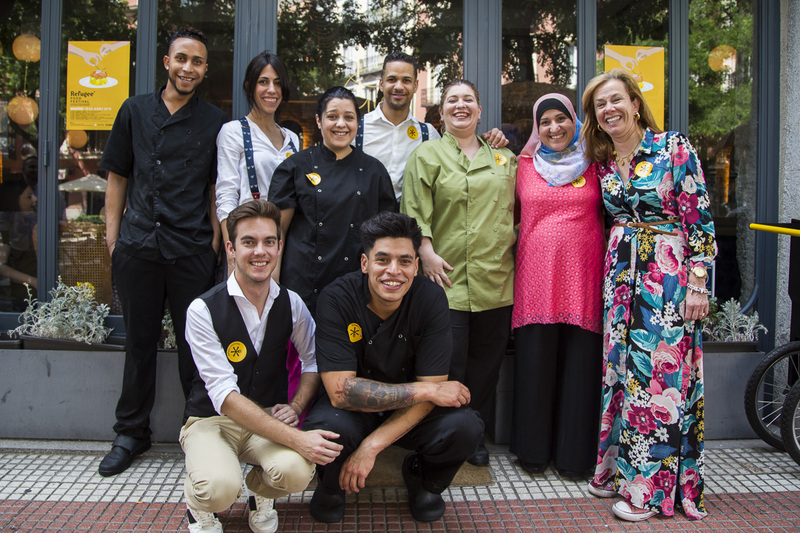 It was hard to believe that we had reached the final day of the Refugee Food Festival in Madrid sitting on the terrace outside Restaurant Gigi with the rich aromas of chef Wesal’s traditional Syrian flavours wafting through the air. Throughout the week eight fully-booked restaurants have flung open their kitchen doors to seven refugee and asylum seeker chefs who have in turn shared their treasured cultural dishes in a professional restaurant environment. The chef cooking up today’s finale was Wesal from Hama, Syria, who has already dazzled this festival with her distinctive Syrian-Basque fusions at Barrutia y El 9. For this Sunday lunch however, she returned to more traditional plates beginning with Mutabal, a light smoky aubergine spread, delicately decorated with beetroot powder. We were then treated to Shakría, a thick creamy shredded goat stew mixed with Greek yoghurt and mild spices. 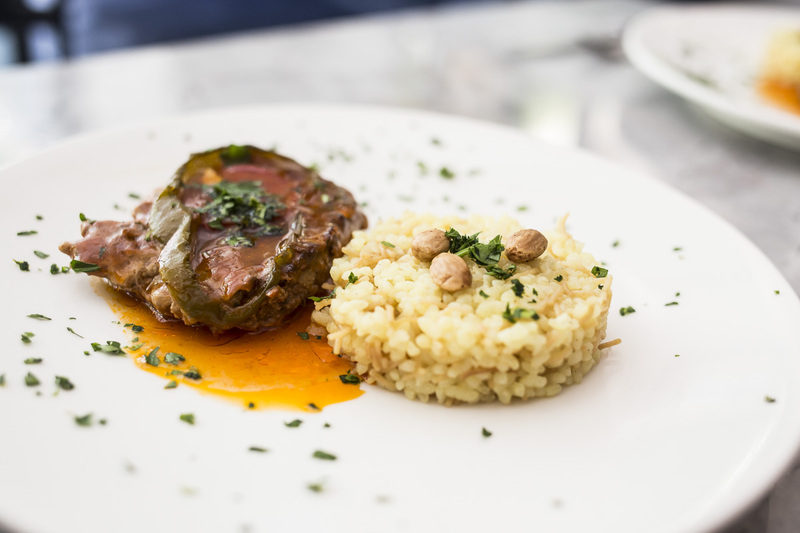 This was finally followed by Lahma be al Synia, an unbelievably flavoursome steak, topped with roasted tomatoes and served with Wesal’s signature rice and toasted almonds. The menu was yet another fascinating insight into the vast but intimate traditions of the chef’s country and family, as each chef has gifted very personal recipes that have often survived generations. Throughout the festival their refreshing and unique cuisine has taken our palettes on a tour that spanned three continents with every plate licked clean. 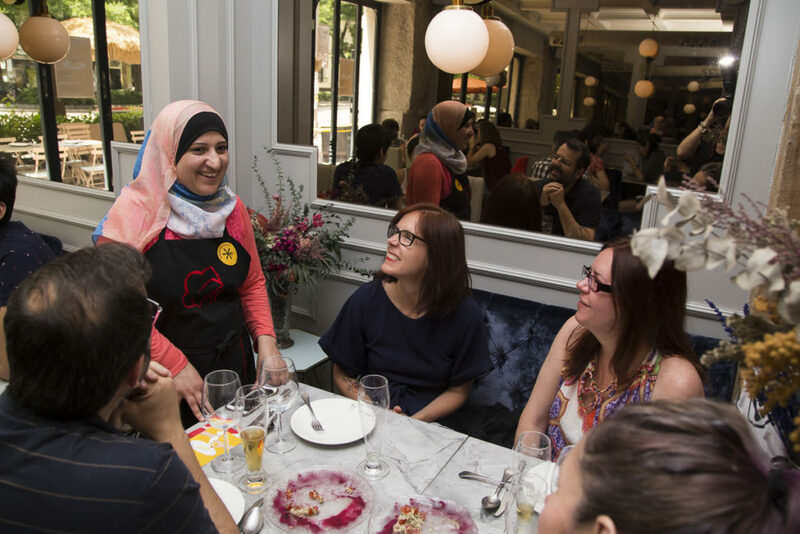 Wesal explains that she likes cooking because it “makes my family and others happy”, a sentiment that has been reiterated by all the chefs this week, and you’d be hard pressed to find even a crumb of dissatisfaction at the end of this week. 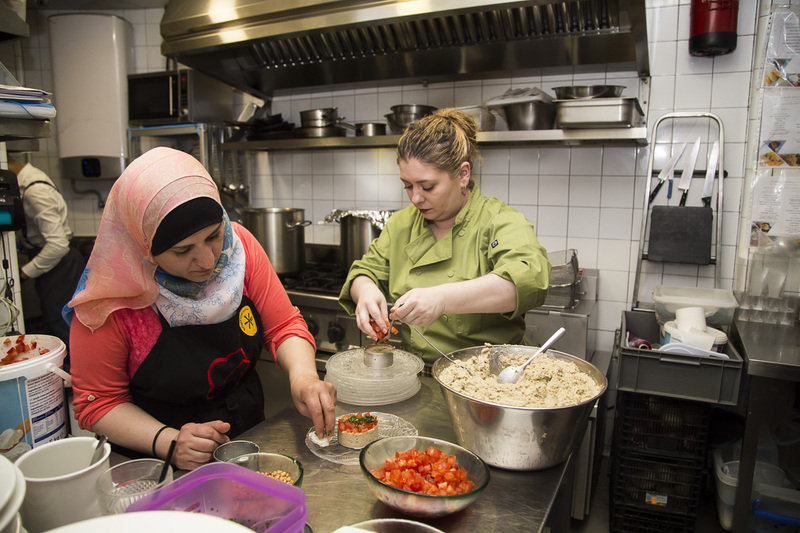 Having first set foot in the kitchen at the age of nine, cooking has become second nature to Wesal, and since participating in last year’s festival, she has “blossomed”, as one MFR volunteer told me, becoming a regular at Chefugee dinners and appearing twice on the roster this week. It was no surprise to hear Gigi’s owner, Pilar, showering her with praise emphasising her “hardworking and professional” attitude. It once again illustrated the important work this festival does in a professional sense, providing essential kitchen experience for chefs who hope to use cooking as a source of income in Madrid while introducing local restaurants to fresh culinary talent and ideas that may even lead to employment opportunities in the future. Wesal’s relentless passion, which has been exemplified by all the chefs this last week, is also a crucial factor in the festival’s mission of dispelling misconceptions. Many of the places the chefs come from are so often shrouded in conflict and turmoil, but with every meal, each chef has brought their own culture and talent to the table, and by using the universal language of good food they have shone a refreshing light on the splendour of their rich traditions and cultures, all the while not forgetting their incredible resilience as they strive to make the best of their new life in Madrid. This resilience was brought home by a tired but smiling Wesal, who upon emerging from the kitchen after days of hard-graft was almost instantaneously pulled away again responding to the pleas of her children back home. With that, she had returned to different but no less demanding work, and the 2018 edition of the Refugee Festival in Madrid had drawn to a close. A final thanks must be given to all the chefs and restaurants involved, as well as all the lucky diners who came to delight in the food. We should not forget the tireless efforts of the volunteers from MFR and Chefugee who were crucial in this events facilitation, and all those from ACNUR, the Paris-based NGO Food Sweet Food, and the numerous other organisations involved in this festival around the world.